The Cigar Galaxy, also known as Messier 82 (M82), is a famous nearby starburst galaxy located in the constellation Ursa Major. M82 appears edge-on when seen from Earth. It has five times the luminosity of the Milky Way and lies at an approximate distance of 11.5 million light years. The galaxy’s designation in the New General Catalogue is NGC 3034. The galaxy was a site of a type Ia supernova in January 2014. The Cigar Galaxy is a site of intense starburst activity, believed to be triggered by its interaction with the nearby Messier 81 (Bode’s Galaxy). M82 belongs to the M81 Group of galaxies, which includes Messier 81, the irregular galaxy NGC 2366, the intermediate spiral NGC 2403, the barred spiral galaxy NGC 4236, the unbarred spiral NGC 2976, the dwarf irregular galaxy Holmberg IX, the peculiar galaxy NGC 3077, and several other galaxies located in the constellations Ursa Major, Draco, and Camelopardalis. 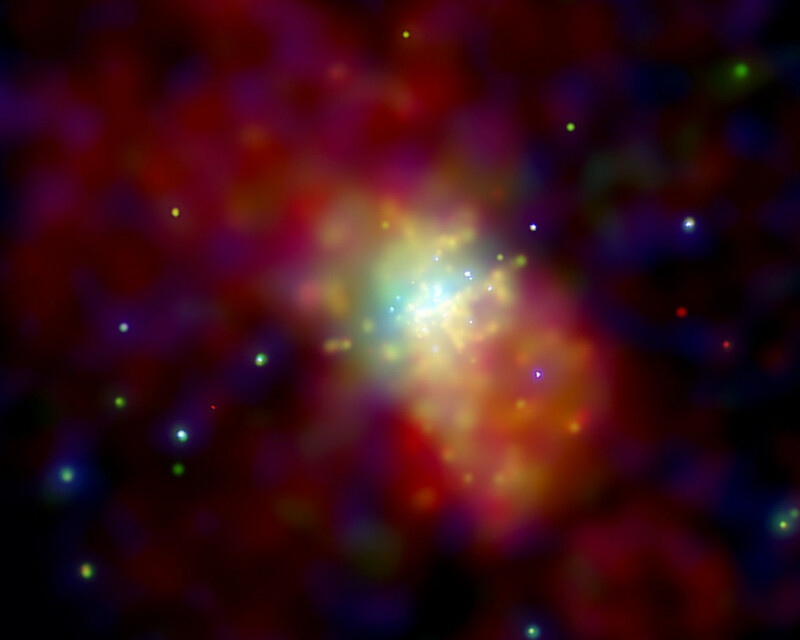 The galaxy M82 contains 197 young massive star clusters in its core region. The clusters were revealed in images taken by the Hubble Space Telescope in 2005. Starburst activity is particularly energetic in the galaxy’s central region, where stars are being formed 10 times faster than in our entire galaxy. The active star forming region in the centre of M82 spans about 500 parsecs in diameter. 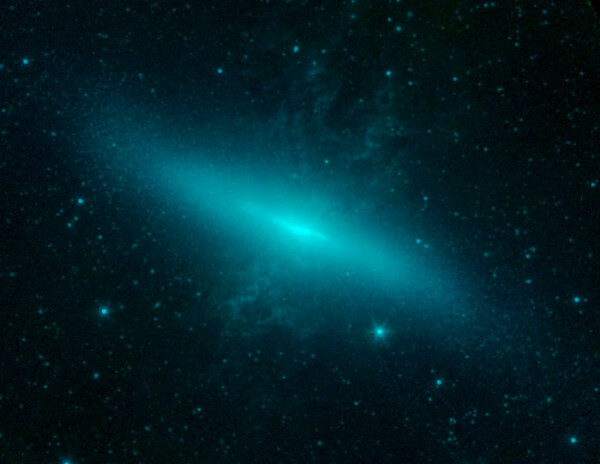 The Cigar Galaxy owes its name to its long, narrow shape and possibly also to the fact that it appears ashy when observed through small telescopes. The galaxy itself is bright enough to be seen even in binoculars. The galaxy’s core contains four high surface brightness regions of clumps that correspond to confirmed sources of inrared, X-ray, and radio frequencies. They are believed to be starburst clusters. Supernovae in this region occur at a rate of one every 10 years. In 2006, fluctuating X-ray emissions were discovered by the Chandra X-ray Observatory from a location some 600 light years away from the galaxy’s core. The source of the emissions is believed to be the first known intermediate-mass black hole with a mass approximately 200 to 5,000 times solar. The Cigar Galaxy has a supermassive black hole at its core, one with a mass of about 30 million solar masses. 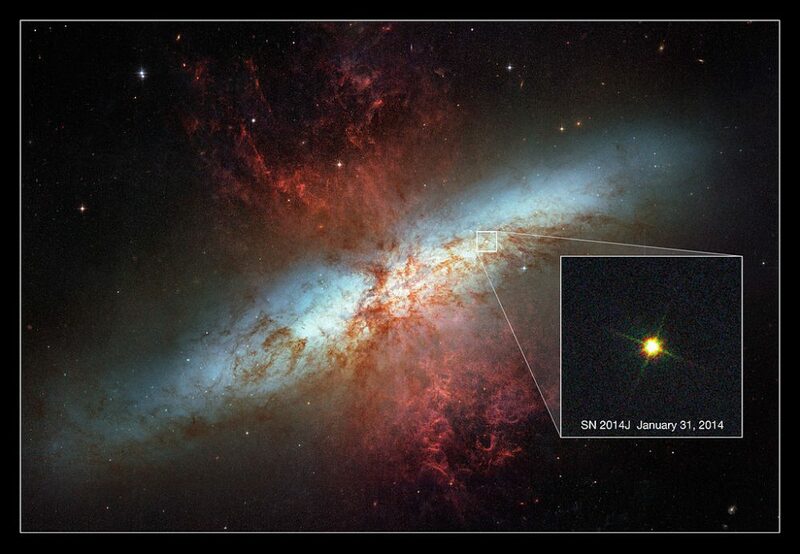 A supernova was discovered in the Cigar Galaxy on January 21, 2014, when Dr. Steve J. Fossey and his students at University College London reported observing a new star in M82 from the University of London Obsevatory. By January 23, the supernova had reached a visual magnitude of 10.9. It was classified as “young, reddened Type Ia supernova,” and the International Astronomical Union (IAU) designated it SN 2014J. SN 2014J was one of the brightest and nearest supernova events seen in recent decades, along with SN 1993J, spotted in Messier 81 in 1993, and SN 1987A, which was even closer to us, only 168,000 light years away, in the outskirts of the Tarantula Nebula, an H II region in the Large Magellanic Cloud in Dorado constellation. A type Ia supernova is believed to occur when too much stellar material piles on a white dwarf, an old star only about the size of Earth, but with gravitational power comparable to that of the Sun. A white dwarf is really the remnant core of a star that was once roughly the same size as the Sun, but then expelled its outer layers of gas, which formed a planetary nebula, while the core contracted into a dense ball of oxygen and carbon. Once the amount of material accreted from the binary companion passes a critical threshold and the white dwarf reaches a mass 1.38 times that of the Sun, it can no longer support its mass against its own gravity. As a result, the star collapses and a thermonuclear explosion is ignited. The stellar material may come from a normal star or another white dwarf, which has already shed its outer layer. Type Ia supernovae always explode with almost exactly the same amount of mass and reach almost the same peak brightness, which makes them excellent standard candles for measuring distances to the galaxies that host them; the fainter the supernova appears to us, the farther away it is. This is a technique used by astronomers and astrophysicists to determine the size of the universe, as well as its age and structure. The Cigar Galaxy is a peculiar galaxy believed to have a distorted disk. It was previously thought to be an irregular galaxy, but near-infrared images of the object taken in 2005 revealed that it has two symmetric spiral arms. 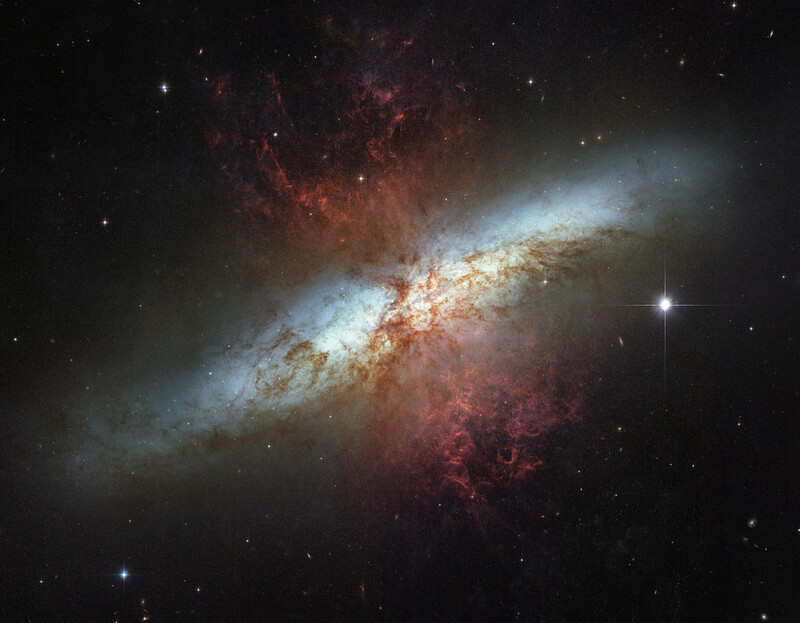 The galaxy’s arms had not been spotted before because M82 is an edge-on galaxy with high disk surface brightness and an intricate network of filaments of dust in optical images. 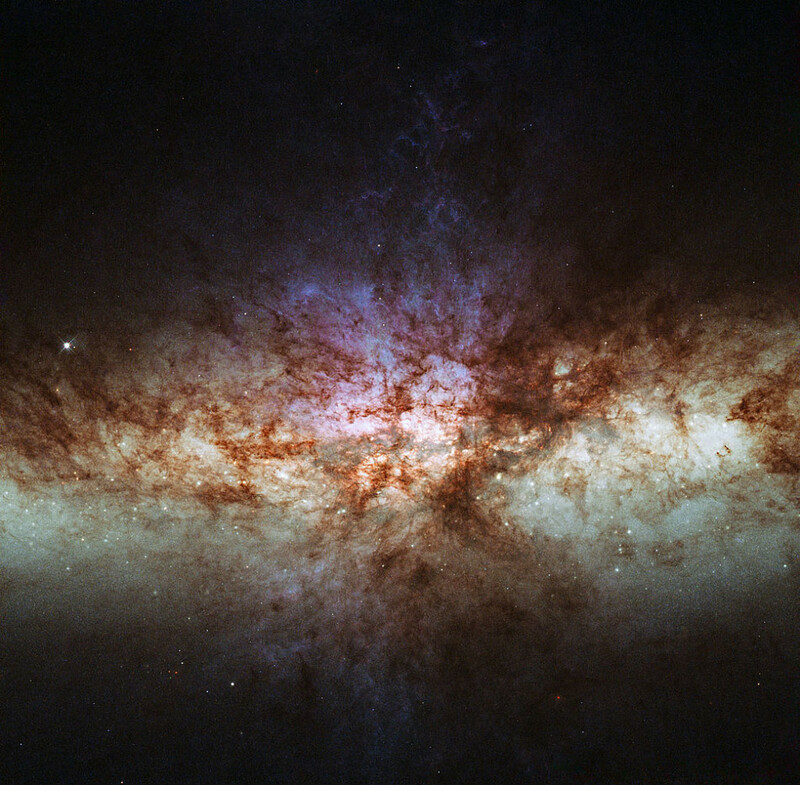 Messier 82 was discovered by Charles Messier, who subsequently included the galaxy in his catalogue in the late 18th century. 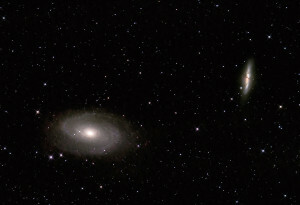 Messier 82 and Messier 81 make a striking pair when observed in small telescopes. 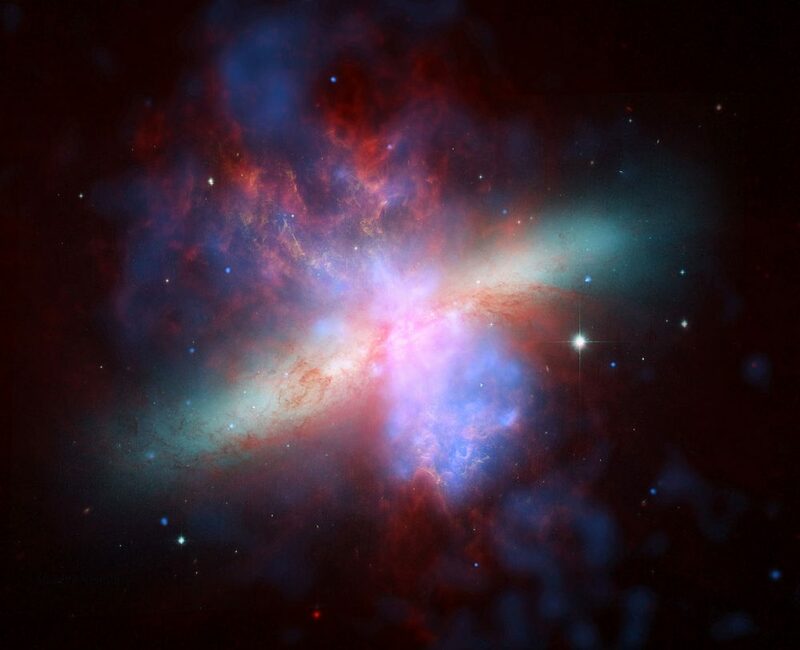 M82 has been physically affected by the tidal forces resulting from the interaction, and starburst activity within the galaxy has increased tenfold. 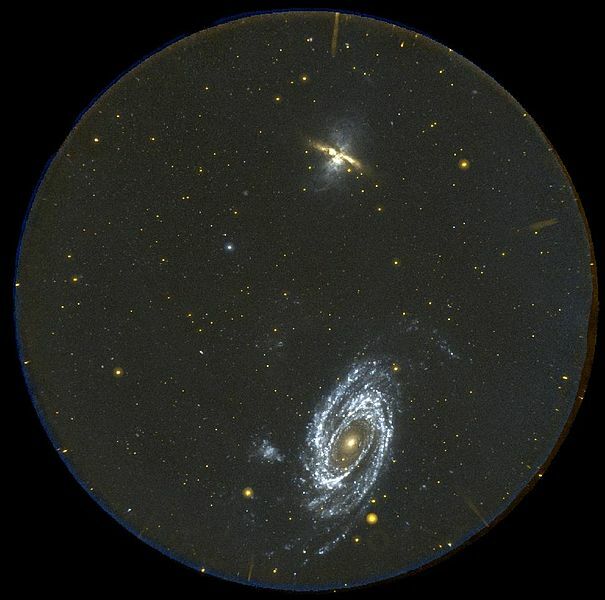 M81 and M82 have been interacting for about 100 or 200 million years. The visual separation between the two galaxies’ centres is approximately 130,000 light years. The stars in the Cigar Galaxy’s disk are believed to have been formed in a burst some 500 million years ago and before the interaction with M81, there had not been any significant star forming activity within the galaxy outside the central region and halo. Before the encounter with Bode’s Galaxy, M82 was likely a low surface brightness object. A radio source was detected in Messier 82 in April 2010, when astronomers at the Jodrell Bank Observatory of the University of Manchester reported finding an unknown object that started emitting radio waves that did not look like anything they had previously seen. The object has been theorized to be a micro quasar, but none of the theories are entirely backed up by the observed data.